Organization with style has never been so easy. This over-the-door hook is designed to hold a wide variety of items - coats, hats, handbags, umbrellas, towels or robes. This item is perfectly suited to fit over any residential door. The Amerock H55457G10 Double Prong Individual Hook is finished in Satin Nickel. Single hooks are most versatile and can be mounted into wood surfaces and drywall. The classic Satin Nickel finish provides a sleek, lightly brushed, warm grey metallic look. Single OTD Hook w/Ceramic Insert Satin Nickel Organization with style has never been so easy. 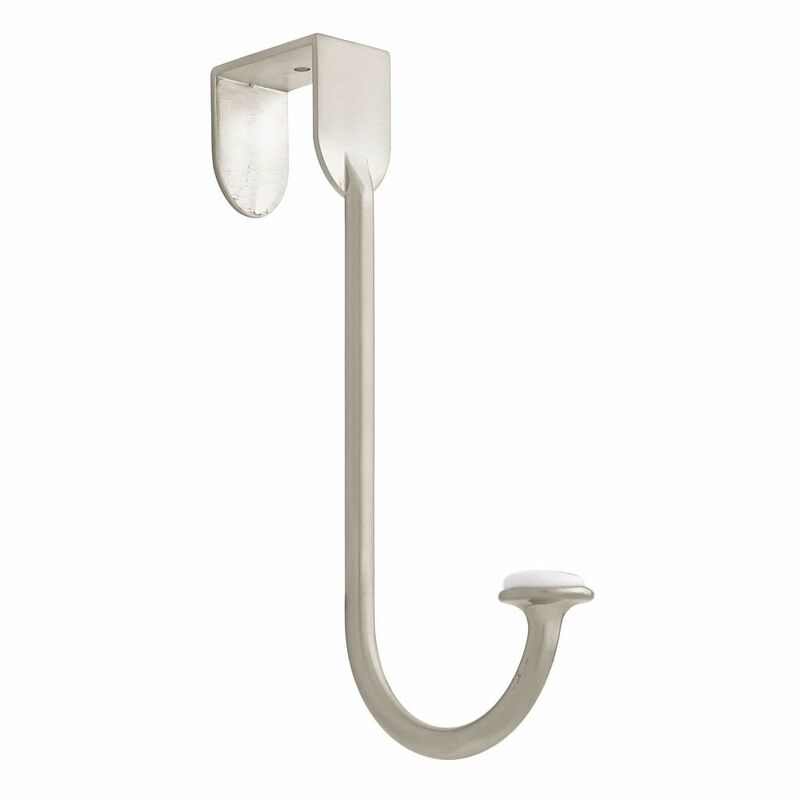 This over-the-door hook is designed to hold a wide variety of items - coats, hats, handbags, umbrellas, towels or robes. This item is perfectly suited to fit over any residential door. Single OTD Hook w/Ceramic Insert Satin Nickel is rated 3.8 out of 5 by 19. Rated 5 out of 5 by jbrown38 from Easy to place over the door and can hold a lot of clothes. Easy to place over the door and can hold a lot of clothes. Rated 4 out of 5 by HomeDepotCustomer from Nice product. Very useful. ... Nice product. Very useful. Rated 4 out of 5 by WM from It does the job!... It does the job! Rated 4 out of 5 by roi4444 from Too long for what we needed (on lower counter doors... Too long for what we needed (on lower counter doors - such under sink). Wish they had shorter ones. Rated 5 out of 5 by szq from Liberty’s 7 inch over-the-door single hook was just what I... Liberty’s 7 inch over-the-door single hook was just what I was looking for. It is sturdy, nice looking and very well priced. Rated 5 out of 5 by Jake from Works good hanging over the bath door. Sturdy enough for the heaviest of robes. Works good hanging over the bath door. Sturdy enough for the heaviest of robes.